On 26 December 2013, while CPTers were doing their routine monitoring of the school patrol at the Qitoun checkpoint, schoolboys threw several volleys of stones at the checkpoint for about a minute. Border police at the checkpoint responded by throwing a sound bomb and then firing a teargas grenade. The grenade entered the second-story window of the Al-Karaky family’s three-room apartment. They were drinking coffee when it landed in their living room and fled the house. The canister started a fire inside the house after the family left. 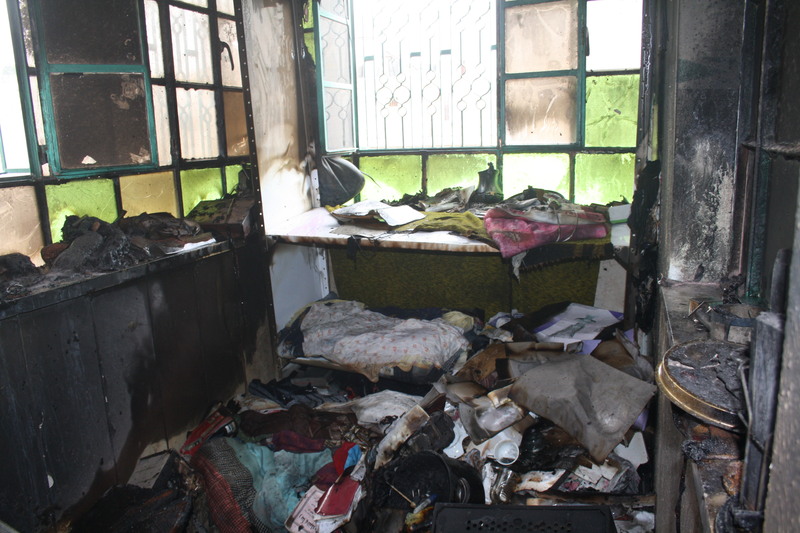 Everything in the small apartment—including numerous books, among them holy books such as the Qur’an—was burned or ruined by water from Hebron’s Municipal Fire Department, which arrived promptly to put the blaze out. This incident is not the first time objects have come through the window of the Al-Karaky home, when boys have thrown stones at the checkpoint and border police have responded by firing back. “We’re always trapped between the stones and what the soldiers shoot,” a family member told a CPTer. They never expected, however, that these almost routine exchanges would result in the four people who lived there losing everything.